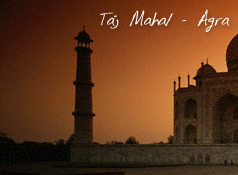 Morning leave for sight-seeing tour, which includes visit to Jama Masjid - the largest mosque of Emperor Shahjahan. Later proceed to visit Raj Ghat- cremation site of Mahatma Gandhi, to India Gate - a 42 meter stone arch built in the memory of the Indian Soldiers who died in World War I, Drive past the President's House & Parliament House, and the Qutab Minar. Overnight stay at Hotel. Morning drive to Jaipur (232 kms / 5 hrs). Enroute visit Fatehpur Sikri the deserted, red sandstone city, Emperor Akbar built that as his capital and palace in the late 16th century is an exhilarating experience. Upon arrival transfer to the Hotel. Evening you may explore the local colourful markets of Jaipur by own. Overnight stay at Hotel. Morning transfer to the Airport to connect flight IT 2331 dep. at 07:30 hrs arrive Jodhpur at 09:55 hrs. Upon arrival transfer to the Hotel. 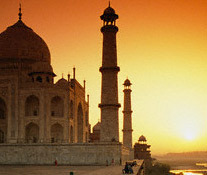 Later proceed to visit the imposing Meherangarh fort with its palaces and outstanding museum. Also visit Mahamandir Temple, Jaswant Thanda, Mandore Garden and Clock Tower. Overnight stay at Hotel. Morning drive to Jaisalmer (285 kms / 06 hrs). Enroute visit Osian which is famous for culture heritage and encient temples. On arrival transfer to the Hotel. Overnight stay at Hotel. Morning leave for sightseeing tour of Jaisalmer, which includes visit to the 12-15th century Jain temples, Folk Museum, Gadi -sar Tank & the colorfully painted homes known as Havelies. Evening visit sand dunes on camel back for sunset viewing. Overnight stay at Hotel. Morning free. Later transfer to the Airport to connect flight IT 2332 dep at 12:00 hrs arrive Udaipur at 14:10 hrs. Upon arrival transfer to the hotel. Later excursion to Eklingji and Nagda Temples. Overnight stay at Hotel. Morning leave for sightseeing tour of Udaipur visiting City Palace, Jagdish Temple, drive around Fatehsagar Lake, Sahelion ki bari (Queen's resort for her friends) and Bhartiya Lok Kala Mandir (Folk art museum ). Overnight stay at Hotel. Morning free. Later transfer to the Airport to connect flight IT 2332 dep at 14:40 hrs arrive Aurangabad at 16:25 hrs. Upon arrival transfer to the Hotel. Overnight stay at Hotel. Morning visit Aurangabad Caves, excavated between the 2nd and 6th century AD, they reflect tantric influences in their iconography and architectural designs. Also visit and Daulatabad Fort, this magnificent 12th century fortress stands on a hill just 13 kms from Aurangabad. After visiting Bibi Ka Muqbara transfer to the Airport to connect flight IC 888 dep at 17:20 hrs arrive Bombay at 18:05 hrs. Upon arrival transfer to the International Airport to connect flight for onward destination.